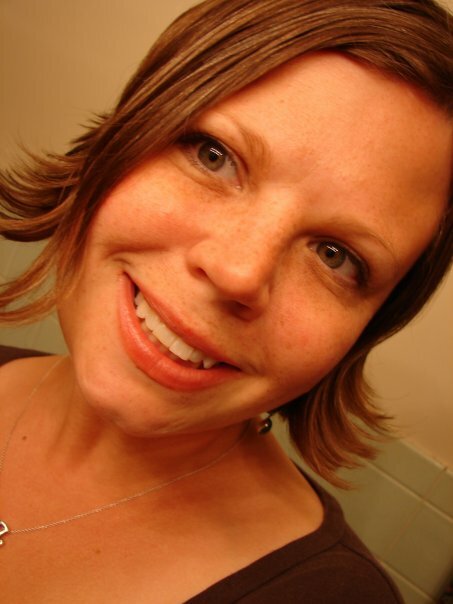 I've had the great joy of discovering a new-to-me blog: Homesick Texan. I say "new-to-me" because judging from my Bloglines, as well as the number of comments that her blog generates - I am one late pixie to *this* party. 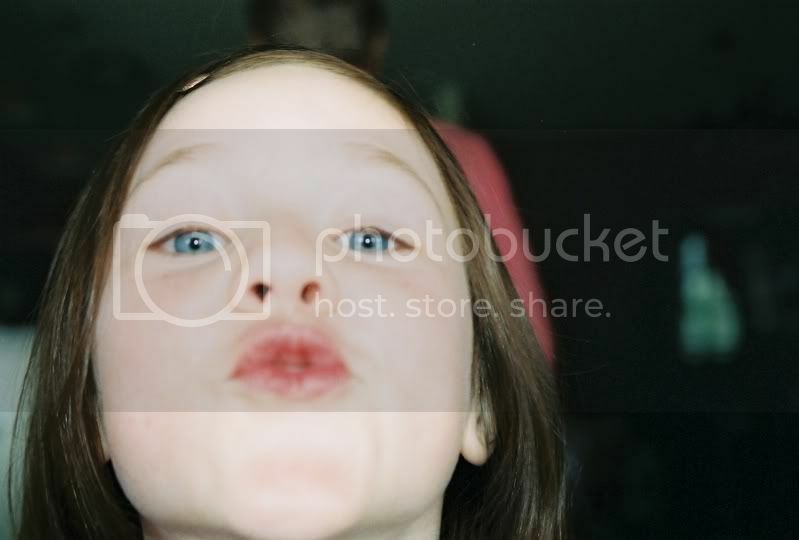 I'm just glad I found it, because I can tell that it's a keeper. And even if it weren't, I would still be forever in debt to the Homesick Texan, for it was she who introduced me to the supreme awesomeness that is the Texas Nacho. 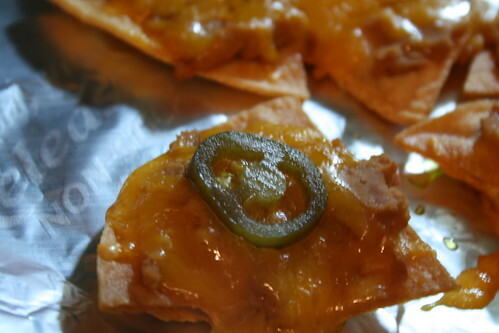 OK - first of all, you need to tot over to Homesick Texan ASAP, and read her post entitled Nachos 101. OK, see now why I wanted you to read that for yourself? There's no way that I could do that justice, not even in a summary. And I don't know about you, but I've got to tell you that I was intrigued. Because my experience with nachos? Totally the big-pile-o'-chips-with-stuff-dumped-on-top one. Don't get me wrong, I have a great appreciation for the "pile o' stuff" kind. But to learn there was a different kind out there? Very, very intriguing. Plus, honestly, they didn't sound that difficult. And it's been icky, cold and wet here lately - so a shakeup to the usual routine seemed called for. 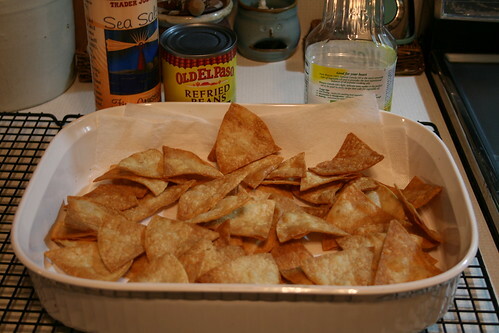 For starters - the Homesick Texan says that you really should make the chips yourself. 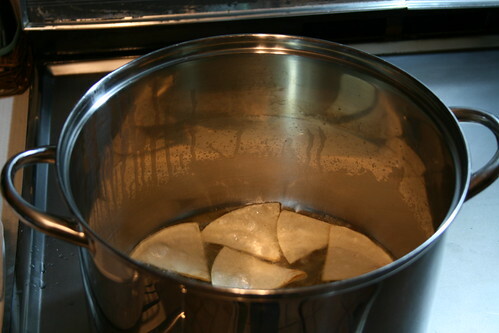 Corn tortillas, cut into sixths, chunked into oil, cooked for a minute or so on each side. Removed from the oil, drained on paper towels, sprinkled with salt. At about this point, Schecky comes wandering into the kitchen. He suspects that I am making popcorn, because "it smells like you're making popcorn!" After the initial "there's no popcorn" disappointment, Schecky asks to try a chip. So he and I sample one each. Sweet cracker sandwich! These things are GOOD! I mean really, Really, REALLY good! 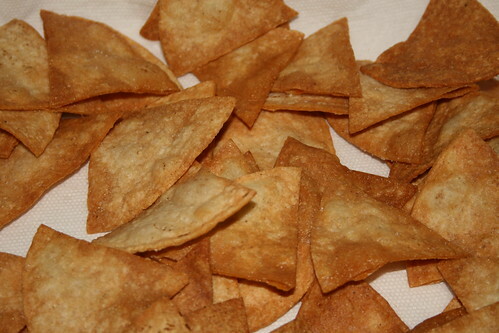 They are much thicker and heartier than a regular chip - which I think will be good for holding up to toppings. I am already impressed beyond all belief with this. 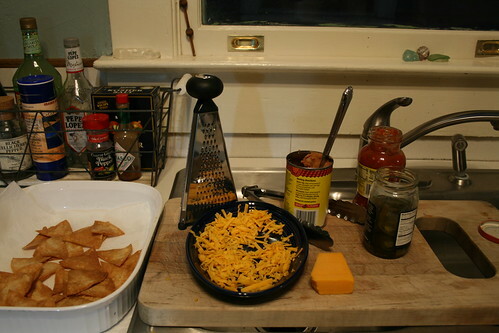 I set up a "Nacho Making" bar. 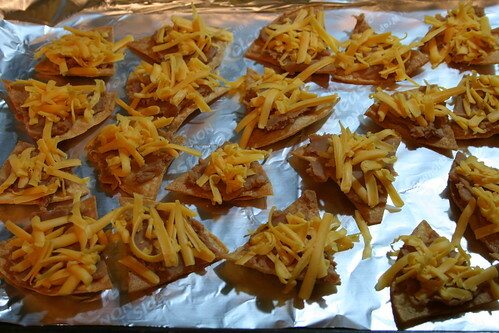 I have visions that everyone can top their own nachos, exactly the way they want. The prevailing attitude was "we don't care, just make them how you want them." So - bean and cheese it is. Everyone will eat that. I'll leave salsa and jalepenos for the table for additional doctoring. Into the oven they go. Yes, you're seeing that correctly, I only ate three. Schecky declared: "This is my favorite thing that you've ever made, EVER!" Bubba was dumb-founded - he kept asking me "You made these chips? For real? You made them?" So - I guess what I am trying to say here is that I highly recommend Texas Nachos. *Sadly, that's pretty much exactly what I said. It's embarrassing, really - somewhere along the line I've turned into a cross between 1982-era Moon Unit Zappa, and Lola. Sounds delicious! And can I just say...I'm SO TOTALLY GLAD I'm not the only one whose kitchen requires me to place a cutting board over my sink to make that extra square foot n' a half of counter space necessary to do anything?! Hmph. So you can make your own chips, huh??? That's awesome! The chip mongers around here will love that. Thanks for the write-up and the new blog! Okay missy, where's my invite for supper? That looks so goooood!!! 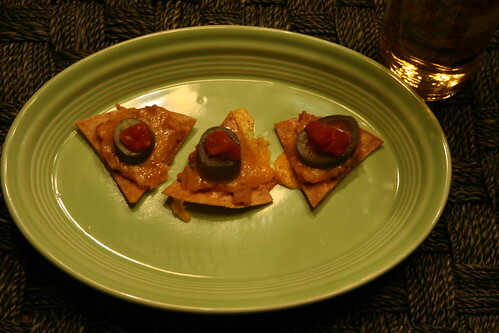 I've been making nachos like this for years and just thought I was O.C.D. How exciting! I can tell people to quit making fun of me for making individual chips!!! It must be my Texan grandmother coming out in me. Oh yeah, been meaning to ask you...where do you stand on the contriversy of the Tennessee/Georgia border being moved so you guys can get more water. It is so funny up here (Tennessee) because people are calling in to radio stations and going,"We'll have the National Guard on our border to protect it." (I'm sure you know you have to say that with the redneck accent and a "chew" of Redman.) Let me know if you guys need some water and I'll send you down a few bottles!!! Dang it, I should have dropped by and had a chip! Maybe I'm really a reincarnated Texan since I have always thought Lazy Nachos were gross and wondered why they were not high quality individual snacks. and I have been eying airfare to Texas. No, really I have. It is now 9:48 a.m. and I am now in desparate need of a nacho. So thanks for that. Can she make it until lunch time or will she go raid the kitchen as soon as this comment posts? there are worse things than sounding like a southern-nacho-making-moon unit zappa. really, there are! you're so adventurous in the kitchen. i may have to try these myself expect they appear to be saturated with oil! I love Homesick Texan!! Her food is the best! You *must* try her chili sauce for cheese enchiladas, it is heavenly(and easy too).